Launched in the U.K.in 1997. Glycolic Acid - derived from cane sugar. Is MD Forte® (Glycolic Acid) a superficial, medium or deep peel? Superficial to Medium depth peel. What skin problems does MD Forte® claim to treat? 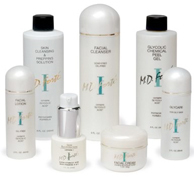 Using an MD Forte ® regimen, you`ll see healthier, younger-looking skin. MD Forte® visibly diminishes the look of fine lines and wrinkles, smoothes and softens skin, increases hydration and suppleness, and balances irregular skin tones. It can also improve oily/acne prone skin. MD Forte can be used on the face, the neck, the chest and the hands and can be used on all types of skin including: Fine skin, normal skin or greasy or thick skin. It can also be used safely and effectively on black and asian skin. MD Forte 2 : 99% glycolic acid - Used for more aggressive treatment of sun damaged skin. Pregnant or breastfeeding women, and those with skin prone to scarring. The MD Forte peel is a glycolic acid peel system that can only be performed as an in-office procedure by a trained professional. It provides controlled and predictable removal of surface skin cells, stimulating skin renewal to improve the appearance of the skin. You will notice a difference in your skin texture immediately. The procedure is fast and convenient, taking only about fifteen minutes to half an hour. And with virtually no recovery time, you can be back to your normal routine the same day. There is no significant pain or discomfort or need for anaesthesia. All body areas appear to respond well to treatment with glycolic acid; however, the arms, hands, neck and chest all improve at a slower rate than the face. Most patients can undergo glycolic peeling without any side effects. The treated skin is virtually normal in appearance. The fact that the patient underwent a peel in usually undetectable to others. Although rare, a patient may experience mild sloughing, producing some weeping or scabbing. Some redness is temporary and normal. Any of these side effects may be covered with make up. Rarely, if scabs are picked, scarring may occur or areas of hypopigmentation (lighter coloured skin) or hyperpigmentation (darker coloured skin) may result from a peel. Your practitioner will discuss these potential side effects in a consultation. This depends on area treated and how much is required, and the practitioner doing the treatment, but ranges are in the region of:£60 to £100 per treatment session. Click for ALL MD Forte ® Peels clinics in the UK & Ireland registered and verified by Consulting Room.